Freedom Alliance supporters and friends from all over the country enjoyed an excellent Army-Navy Weekend in Philadelphia, December 10-12, with Freedom Alliance President Tom Kilgannon and Honorary Chairman LtCol. Oliver North. Upon arrival Thursday evening, guests mingled at a Welcome Reception and briefing from LtCol. North and former Deputy Undersecretary of Defense for Intelligence LtGen. Jerry Boykin. Boykin, one of the original members of the US Army’s Delta Force, spoke again to attendees Friday morning during breakfast. He discussed US foreign policy and his book Never Surrender: A Soldier’s Journey to the Crossroads of Faith and Freedom. Friday afternoon was spent on a tour of Joint Base McGuire-Dix-Lakehurst. First was a look at the base’s new recreation center, next guests were taken to the New Jersey National Guard Battle Lab. The tour of the Battle Lab included hands on demonstrations of training aids and devices used in support of training programs like simulated weapon shootings and obstacle courses. Many expressed that the best part of the tour was lunch, in which guests were seated with airmen stationed at McGuire. Before departure guests got to explore the inside of a Boeing KC-135, a military aerial refueling aircraft. Freedom Alliance special guests for Army-Navy weekend were scholarship recipients Cyle and Eric McNulty, the sons of Army Master Sergeant Michael McNulty. MSgt McNulty was killed in action on June 17, 2005 when he received a gunshot wound to the abdomen during a house clearing operation in Al Qaim, Iraq. Cyle and Eric’s sisters Katie and Rebecca will also be eligible for a Freedom Alliance Scholarship when they start college. Cyle told Freedom Alliance that his scholarship means so much to him because it allows him to focus on school without worrying about how to pay for it and he can use that extra time to stay close with his family, which is important now more than ever. On Saturday, attendees enjoyed breakfast and heard a speech from Bob Hamer, author and retired FBI agent. Hamer discussed the challenges of being an undercover FBI agent and his books Enemies Among Us and The Last Undercover. 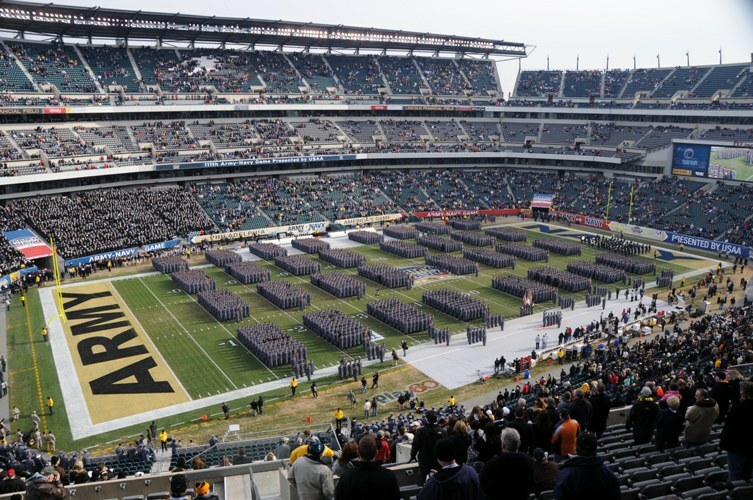 The weekend concluded with the 111th Annual Army-Navy football game. Freedom Alliance guests enjoyed the greatest rivalry in college football from catered skybox suites above Lincoln Financial Field. The Midshipmen beat the Black Knights, 31-17, for their ninth-straight victory over Army.